This is the Japanese hardback edition of The Fallen Man, published in 1998 by DHC corporation in Tokyo, Japan. The text was translated into Japanese by Yuko Tsumori. 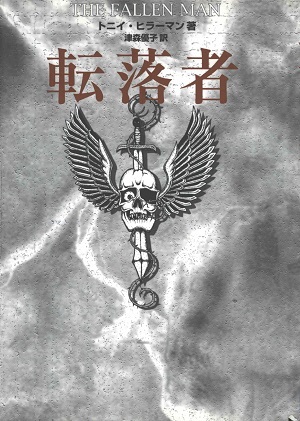 The cover features a sword wrapped in thorns impaling a skull with wings. Format: Hardback, 19.5 x 13 cm. Binding: Cream colored boards with the cover illustration printed in black on the front board. The title, author's name, translator's name and publisher are printed on the spine.